Organ Trail: Director’s Cut developer, The Men Who Wear Many Hats, does what any creative genius would do and takes something we have nostalgia for and throws some zombies into the mix. Organ Trail: Director’s Cut developer, The Men Who Wear Many Hats, does what any creative genius would do and takes something we have nostalgia for and throws some zombies into the mix. American schoolkids of the late 80’s know all about a little gem of an edutainment game called Oregon Trail. In a mostly turned based “watch as the wagon moves left” type of game, Oregon Trail educated kids on the issues pioneers faced as they moved west along the Oregon trail. It mixed resource management and menu based decisions with random happenstance like dysentery and broken bones that could kill you and your family members. 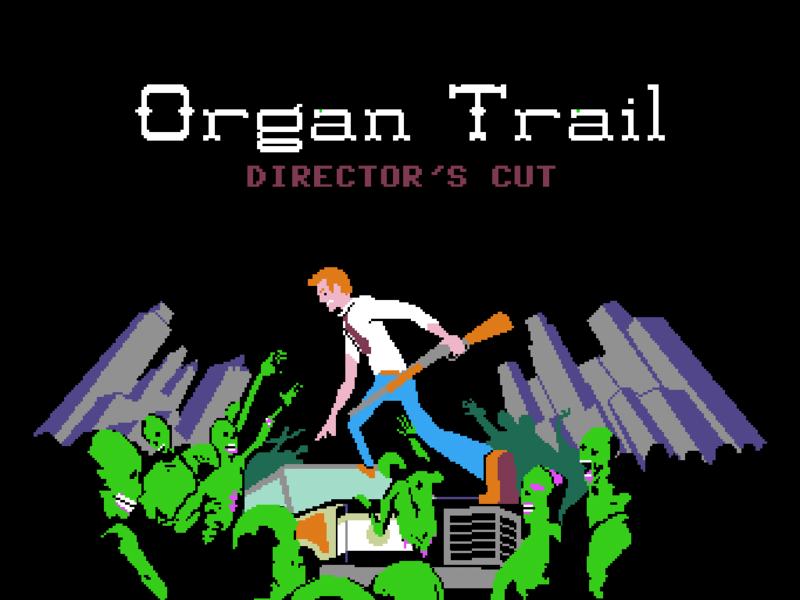 Organ Trail takes the idea, puts it in the modern era and instead of a horse-drawn wagon players are behind the wheel of a wood paneled station wagon. You lead a group of four other people from the soon to be nuked Washington D.C. to a place called Safe Haven in Oregon. Along the way you have to deal with zombies, bandits, injuries, and weather all while managing you dwindling supplies. For the most part, Organ Trail plays like Oregon Trail. A large amount of time will be spent on a screen that shows your station wagon driving left and after most turns some random thing happens like getting an update mentioning someone is annoying or come down with dysentery or the ultimate comeuppance, bitten. You can stop after each turn and at landmarks and interact with your party, car, supplies, and town if there is one. The group/car/supply management is where Organ Trail expands on the gameplay of Oregon Trail. The original hunting game had players walking around on a single screen shooting game for food. Organ Trail ups that ante by keeping the same concept but has the player collect items and shoot or avoid the zombie horde coming after them. This is further expanded in the ability to do jobs in town for resources. Some jobs have you moving across a scrollable battlefield in search of a lost crate or hunkering down behind sandbags and killing off bandits or zombies. The only drawback to these classic gameplay sequences are the shooting controls are really hard to get a handle on. The game says to draw a line from to the enemy but that appears to be left over instructions from the touch screen based versions. I found the most success clicking the mouse behind the player and lining up shots almost like old school pool games. No matter how you get a handle on the shooting mechanics, they make the game harder than it should be. Featuring only 16 colors, Organ Trail creatively captures a surprising amount of character in the graphics of a bygone era. The graphics throwback to the Apple II era to give an authentic nostalgic look that captures the nature of the zombie apocalypse perfectly. Another boon for Organ Trail is the audio work of one Ben Crossbones. The sound effects go for authenticity matching the Apple II but the actual soundtrack is masterful capable of setting the mood with rock style tracks that strangely don’t seem out of place. There are 3 more modes outside of the main adventure in the Director’s Cut. Endless mode never ends and has unlockable modifiers to change up the experience. Clement’s Quest is reminiscent of games like Excitebike and have players driving the station wagon from DC to Safe Haven over mountains while running over zombies while their food levels countdown. After beating the game, Halloween mode is unlocked and turns all of the zombies into costumes and food is candy. Organ Trail: Director’s Cut plays strongly on both nostalgia and spoofing. Those that had not grown up on Oregon Trail might not see the appeal or appreciate the amount of love that the developers put into enhancing the original experience while keeping it rooted in it’s authenticity. As rose tinted as my glasses may be, Organ Trail is definitely a worthwhile experience with a surprising amount of depth.